I have had this banner made for 2 weeks but haven’t remember to photograph it and blog it. 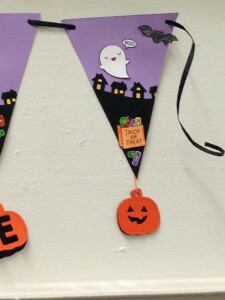 Extra Details: I began by cutting all of the triangle shaped pennants from some light purple card stock. I used the WE R Memory Keepers Banner Border for this. I stamped a starry back drop in silver ink on the pennants. You can’t really see it unless you are very close. Next, I die cut and layered the house silhouettes. I added some small yellow rectangles behind the houses to give the windows and doors some interest. I stamped and die cut the candy pieces next. 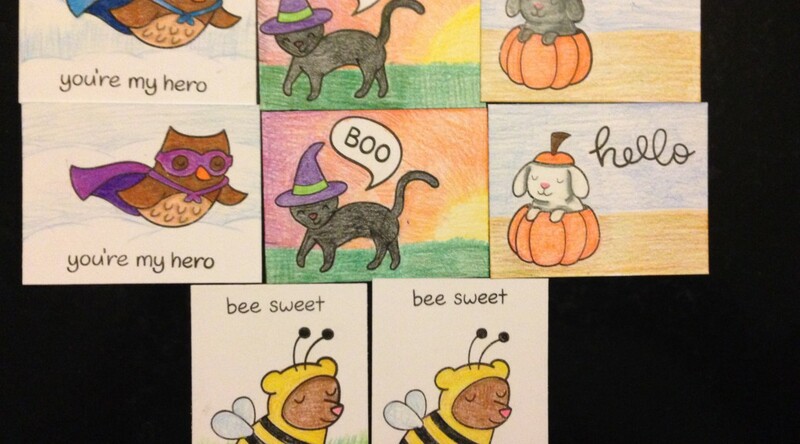 In the interest of time, I stamped the candy on some colored card stock so I didn’t even have to color it. 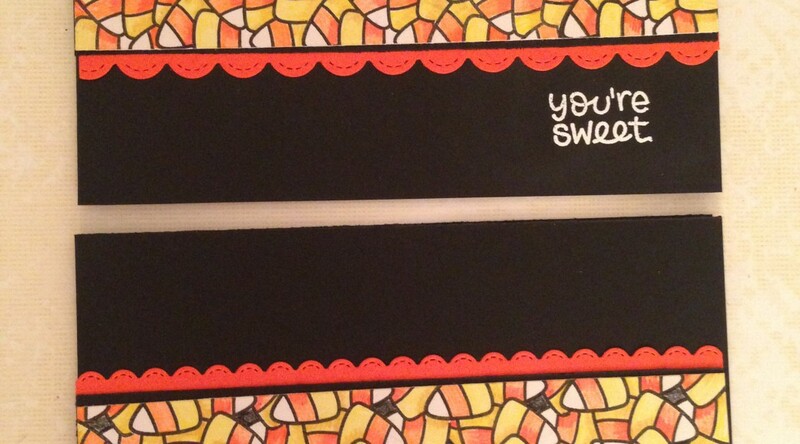 I did add a few little details with a white gel pen after I glued the candy on. 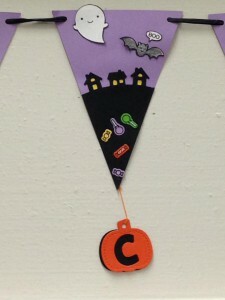 I stamped, colored and fussy cut the bats, ghosts, and candy bags. I used Prismacolor pencils for all of the coloring. I added these to my scene using liquid glue. 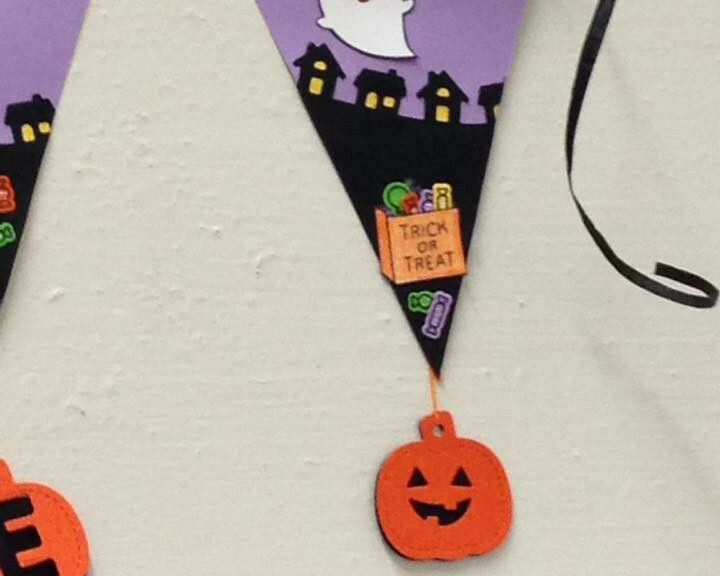 I die cut the tiny pumpkin tag nine times from orange and black card stock. I used the Jack O’ Lantern Face in two of the orange pumpkins and the letters for WELCOME in the others. 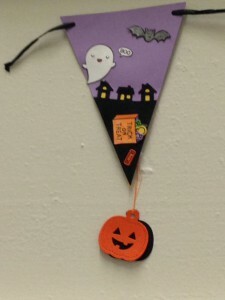 I tied them together with orange thread and hung them from the bottom of the pennants. I just got Lawn Fawn’s How You Bean? stamp set and wanted to use the cute little jar. It being almost Halloween, I went with a spooky lab scene. 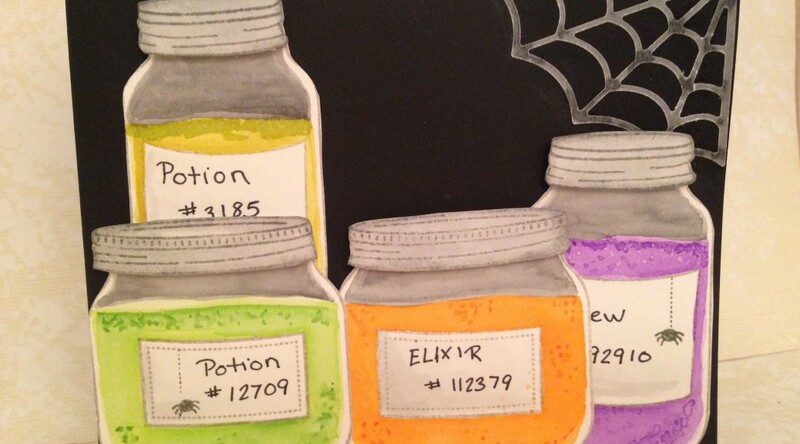 Extra Details: I stamped all of the jar and lids on water color paper. I used grey ink to stamp everything with. I added some labels to the jars. I used Distress Inks to water color the jars. Once everything was dry, I fussy cut everything out. I hand wrote the names on the labels with a black pen. I also added a few spiders for interest. I adhered a velum cobweb to the top right corner of a black card base. 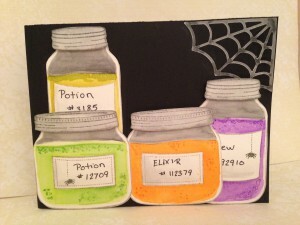 I adhered the lids to the jars with foam tape and then adhered the jars to the card base. For the inside of the card, I created a white liner. 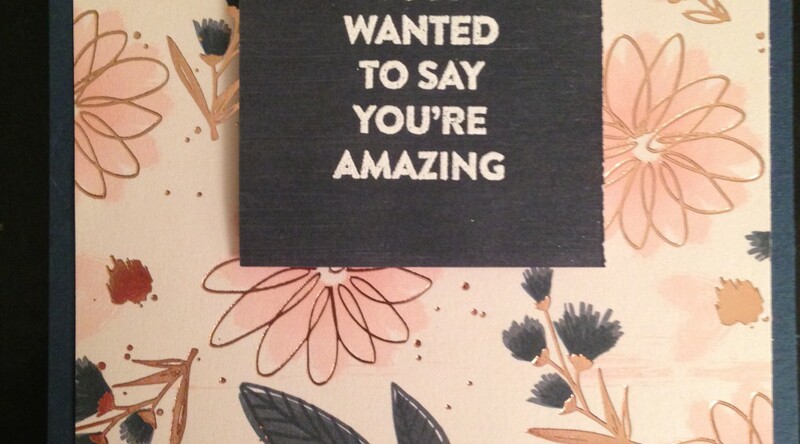 I used a slightly darker grey ink to stamp the sentiments. 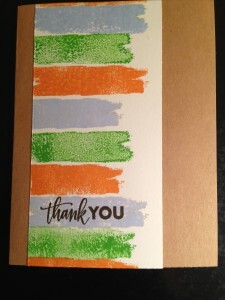 I used the same Distress Inks I water colored with to stamp the bubbles on the liner. I adhered it to the card base and the card was finished. 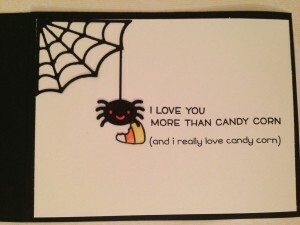 I love making Halloween cards. 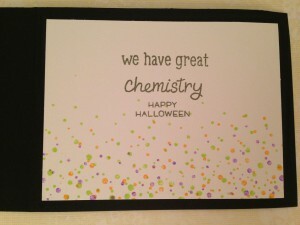 There is just something fun about making cards that are just a little on the darker side. 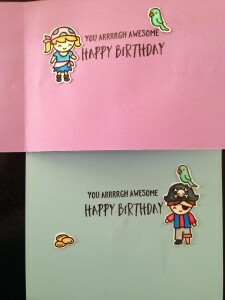 Here are two cards I made using the new Lawn Fawn How You Bean? Candy Corn Add On set. 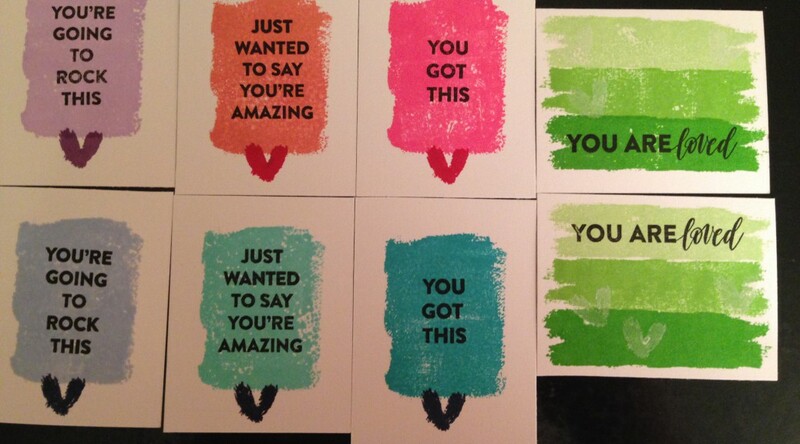 Extra Details: I began these cards with a strip of paper that was 1.5” inches wide. 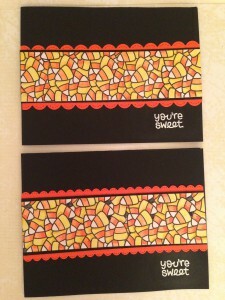 Using masking, I stamped the candy corn group all the way up the strip. I used Prismacolor pencils to color all of the images. On one strip I only used orange and yellow; on the other strip, I added a few black areas. I adhered the colored strip to a slightly larger black strip of card stock. 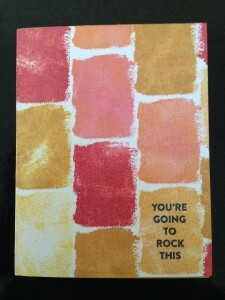 Then I layered that on a strip of orange card stock that had be cut with a scalloped border die. I used the smallest scallop on one of the orange strips and the medium on the other. Then I adhered those strips to a black card base. 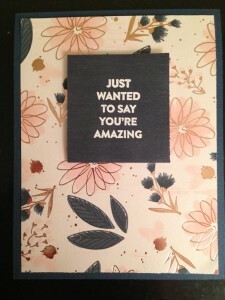 I added a sentiment with white embossing powder. I cut a white liner for the inside of each card. I added a die cut spider and web. I stamped the sentiment and adhered the candy corn. Lastly, I adhered the liner to the inside of the cards. My favorite part of long weekends is being able to spend time crafting. I’ve been really productive this weekend. Here is a set of Lunch Box Notes I made for the kiddos. Extra Details: I began these notes by cutting a half sheet of white card stock into eight pieces. 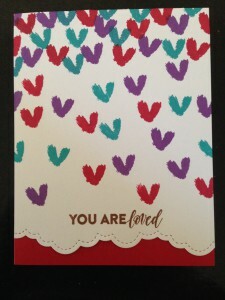 I stamped the images and sentiments on to the cards. I used Prismacolor pencils to color everything in. I even created a few backgrounds with the pencils. World Card Making Day was so much fun. I watched a ton of inspirational videos on YouTube and created a number of cards also. My kiddos have a birthday party to attend in a few weeks. 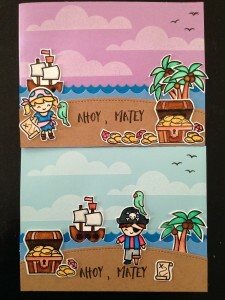 The party has a pirate theme and is for a brother and sister. Each one of my kiddos made one card and they decided to make a tag with the left over images. 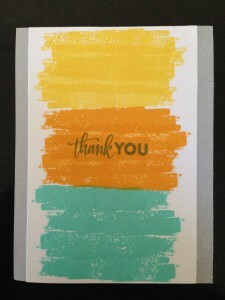 Extra Details: We began these tags with the left over tags from the Simon Says Stamp September 2017 Monthly Card Kit. I die cut a larger stitched circle around the existing shapes. I ink blended some brown ink on each tag front and added some wood grain stamping with the same ink. I added a sentiment to the back of the tag at this point also. 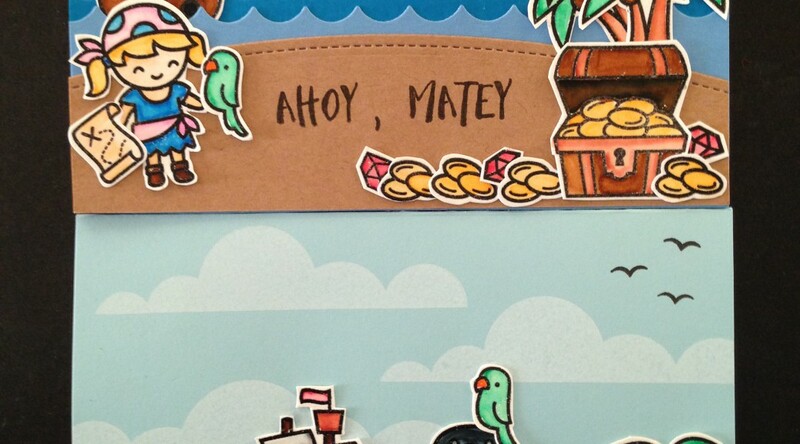 We also had some images left over from the Pirate Birthday Cards, we had just finished. We used these on the tags, so everything will coordinate. I ink blended some light blue ink on the inside of the tags to create a sky. 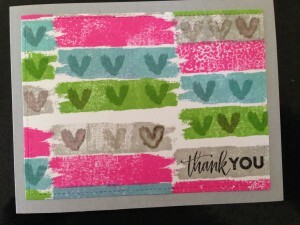 I added two layers of blue card stock cut with a scalloped border die to look like waves. 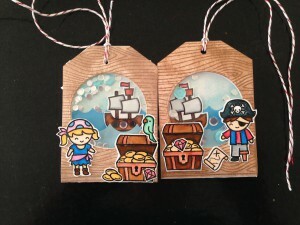 We added a ship on the inside of each tag as well. I adhered some clear plastic over the window of each tag. We layered some foam tape on the inside of the card to create a shaker pocket. We added some light blue and clear sequins and closed the tags up. 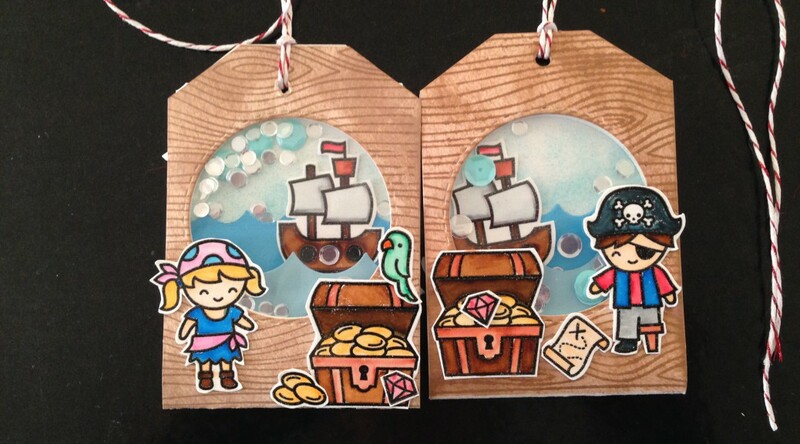 My kiddos played with the placement of the rest of the images on the front and back of the tags. I adhered everything with liquid glue and set the tags aside to dry. 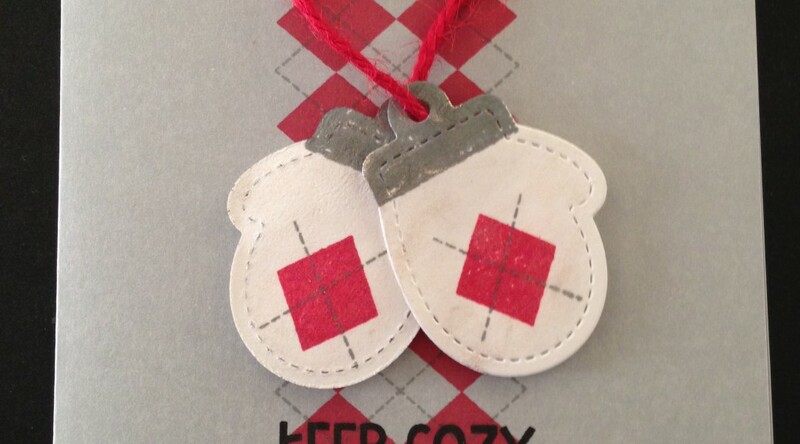 Lastly, I added some red and white twine through the holes. Now the tags are ready to tie on the gift bags. World Card Making Day was so much fun. I watched a ton of inspirational videos on YouTube and created a number of cards also. My kiddos have a birthday party to attend in a few weeks. 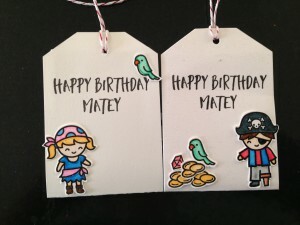 The party has a pirate theme and is for a brother and sister. Each one of my kiddos made one card. They used the same stamp set. 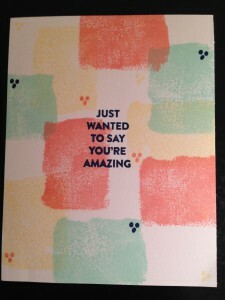 Extra Details: We began these cards by stamping a lot of images on a half sheet of water color paper. 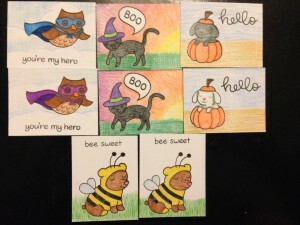 I used Versa Fine ink and clear heat embossing powder so that I could begin water coloring the images right away. I used Crayola Fine Line markers and a water brush to color all of the images. Once the images were dry, I fussy cut everything out, leaving a small white border. The cards were assembled in very similar ways. 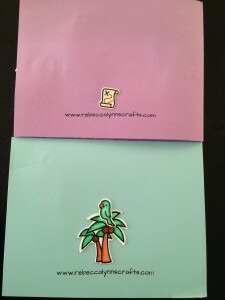 Each kiddo chose a card base; light purple and light blue. We stamped some clouds with white pigment ink. We also added a few birds with black ink. I die cut two sets of waves and a beach for each card. I used two shades of blue card stock and a scalloped border die for the waves. I used kraft card stock and a stitched hillside die for the beach. I layered the beach and waves together and adhered them to the card bases. Next, the kiddos arranged all of their images on the card front. I used liquid glue to adhere everything down. 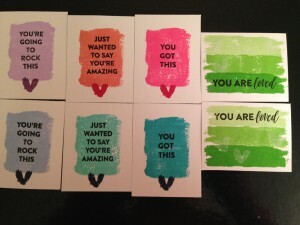 Once dry, we stamped the sentiment on the outside and inside of the cards. There were a few images left over, so we adhered them to the inside of back of the cards. 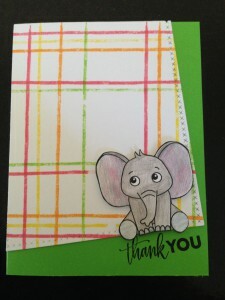 Extra Details: I began this card with a light grey card base. I stamped the solid diamonds in red ink. I added the stitching in grey ink. 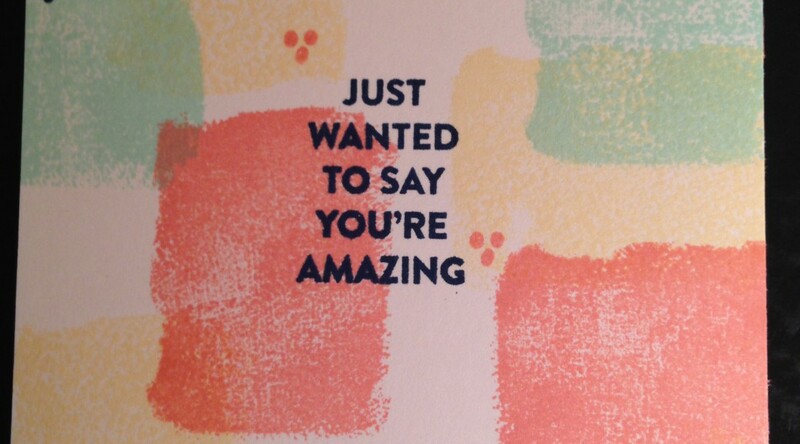 I stamped the sentiment in black ink to help it stand out. I die cut the mittens from some white card stock. I flipped one mitten over so that it looked like I had a pair of mittens. 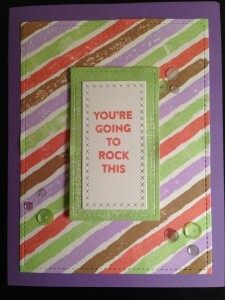 I stamped the diamonds and stitching with the same inks as the card front. I stamped the grey ink pad on the cuffs of the mittens to add some more color. I used a red twine from my stash to connect the two mittens. I adhered the mittens to the card base with foam squares. I used a little liquid glue to adhere the twine to the card base. Lastly, I added some Wink of Stella to the mittens for some sparkle.